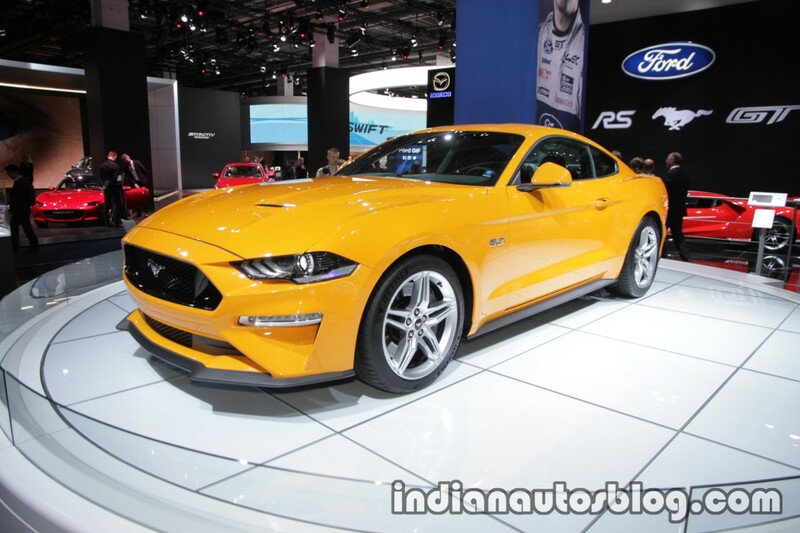 Ford has showcased its iconic pony car, the 2018 Ford Mustang GT in its Euro-spec at the 2017 Frankfurt Motor Show. Here are the live images of the car from the show. The 2018 Ford Mustang is sleeker and more athletic. The headlights, DRLs, tail lights and indicators all use LED technology. The bonnet profile is now lower with integrated air vents, and a revised lower grille design for better aerodynamics. The rear bumper and diffuser are redesigned as well. 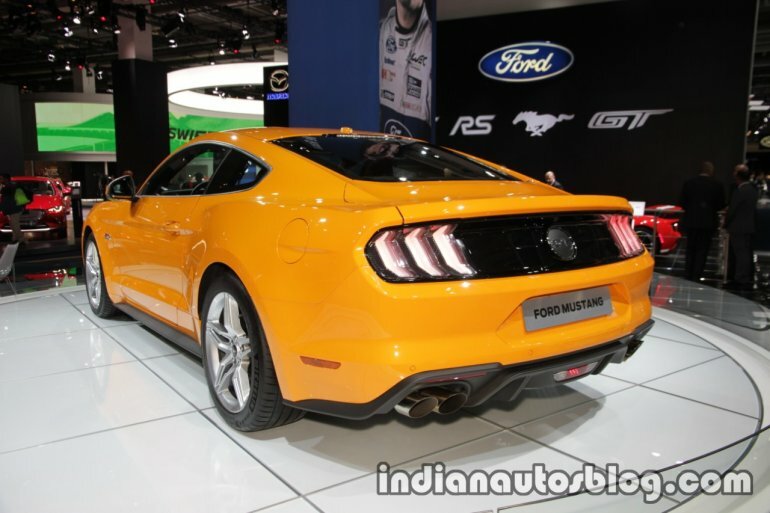 The 5.0 litre variant gets quad exhaust pipes as standard. Boot spoiler is an option. The Active Valve Performance Exhaust features a ‘Good Neighbour Mode’ which makes the exhaust note more bearable for early-morning or late-night driving. There’s a choice of 11 exterior colours and new alloy wheel options as well. Swing the doors, and you will be invited to a more premium interior. The door linings get soft-touch materials, and the door handles are finished in aluminium. The centre console features a new contrast hand-stitched, soft-touch wrap. Leather-trimmed, heated and cooled seats, and a heated steering wheel are also offered across the lineup for the first time. Right-hand drive customers can now also opt for the leather Recaro racing seat in Ebony Black leather. The car gets a 12-inch LCD instrument cluster and SYNC 3 system with an 8-inch colour touchscreen featuring pinch and swipe gestures. The 5.0-litre V8 in the 2018 iteration of the Mustang is tuned for more power and higher rev-limit. It generates 450 PS of power and pairs with a 6-speed manual transmission. A smaller 290 PS 2.3-litre EcoBoost is available as well. A new 10-speed automatic transmission is also available as an option. Electronic line-lock is standard in both the variants which allows rear wheel spin (to warm up the tyres) while the car is stationary. The optional MagneRide Damping System enhances the car’s handling. In addition to the Normal, Sport, Track and Snow/Wet driving modes, there are two new modes: Drag Strip Mode and My Mode. The former is apt for drag races while the latter can be used for fine-tuning the car’s character according to the user’s needs. Safety features include Pre-Collision Assist with Pedestrian Detection, Adaptive cruise control, lane departure warning and Distance Alert technology. A convertible variant is also available. Deliveries of the 2018 Ford Mustang GT in Europe will begin next year.